Get A Kick Out Of Our Kids Martial Arts Today! There's no better way in Shrewsbury to help you child grow than our Kids Martial Arts classes at Imperial Martial Arts. 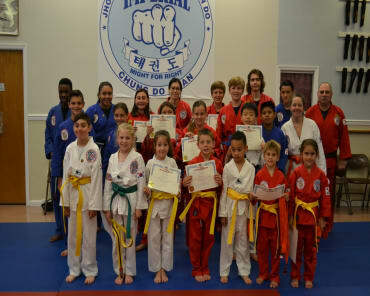 Our talented team of black belt masters has assembled the most impressive program of Kids Martial Arts classes available anywhere in Monmouth County. More than any other school in the area, our instructors know how to teach the many techniques of Martial Arts. That’s because our team of instructors has been doing it for nearly 40 years! Kids love our enthusiasm, and we make sure each and every Kids Martial Arts class is bustling with high-energy excitement and fun! We’ve designed age-specific classes to match your child’s own ability and we work hard to connect with each child individually for the best possible results. Whether your children have never taken martial arts classes before or whether they’ve already achieved their very first black belt, Imperial Martial Arts has a program that’s just right for them. Our Kids Martial Arts Classes are divided into a traditional belt progression with clear goals and achievements each student can set their sights on. As students progress and their skills improve, we continue to challenge them with new and exciting opportunities. Our Juniors program gives kids a lifelong appreciation for physical fitness. We emphasize the importance of self-respect and self-confidence. We reinforce the traditional martial arts values of honesty, courtesy, integrity, and respect. We teach self-control, self-restraint, and respect for others. Give It A Try Today With A FREE Kids Martial Arts Class! Start your child on a lifelong journey of fitness and character-building with our Kids Martial Arts Classes at Imperial Martial Arts. We are proud to offer you the chance to try out a FREE Kids Martial Arts Class so you can see what we're all about. We guarantee you’ll notice a big difference in your children after their first class. To get started or to learn more about the classes we offer in Shrewsbury, simply fill out the short form on your screen and a member of our staff will be in touch soon!